"What do you want with me?" — frontispiece by E. A. Abbey for Dickens's "Christmas Stories"
With models afforded him by John Leech (1843) and Sol Eytinge, Jr. (1869), Edwin Austin Abbey nevertheless chose to focus on the fortunes of the Cratchit family (members of whom appear in three of six scenes) and the spiritual reclamation of the inveterate miser and canny capitalist Ebenezer Scrooge (reduced to just two appearances in the American Household Edition). 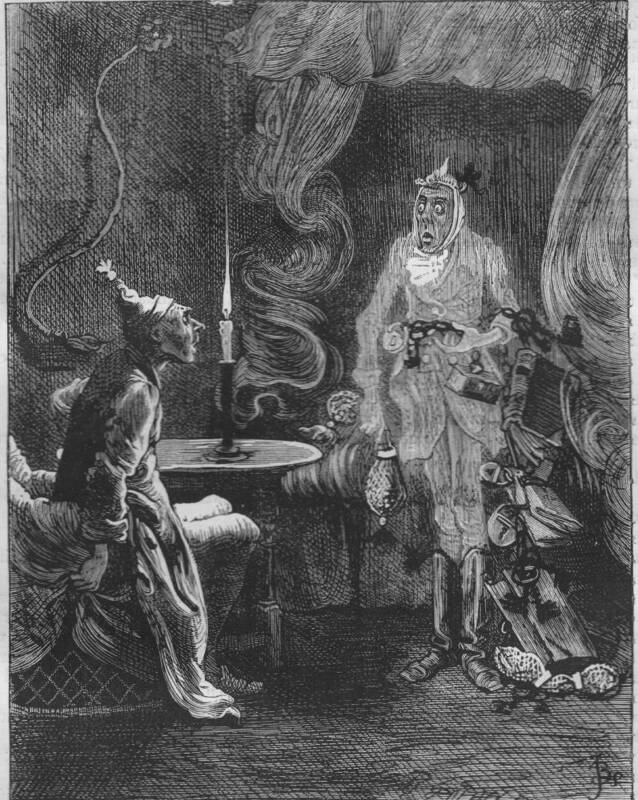 Realising the most famous scene from among the whole run of Dickens's "somethings" for Christmas from the 1840s through the 1860s, Abbey reimagines the fateful confrontation of Jacob Marley's ghost and his quondam business partner in the latter's bed-sittingroom as a dark plate, in the manner of Hablot Knight Browne (Phiz). 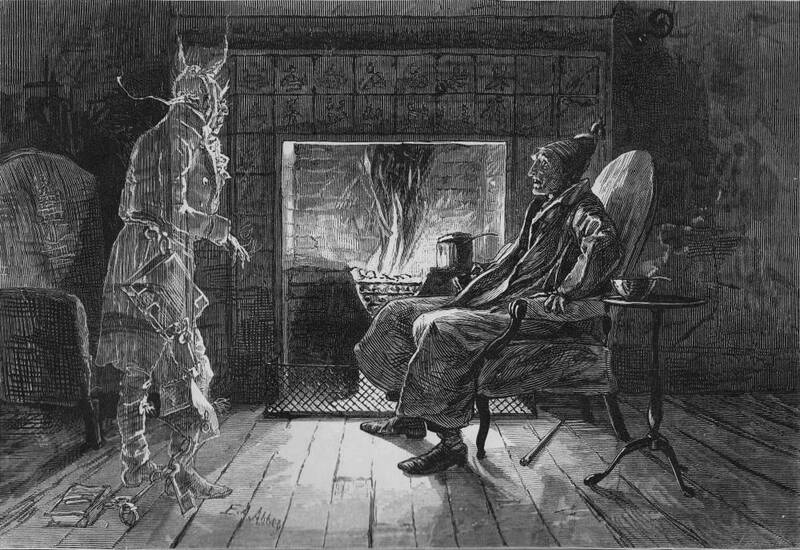 The dimly lit room, the terrified Scrooge, and his ghostly visitor combine to create a mood far different from John Leech's charming caricature "Marley's Ghost" (1843). With a larger space to fill but without recourse to colour, Abbey has assimilated his predecessor's work and transformed the scene into something entirely different, as the spectre presages what Scrooge himself must inevitably become, a spirit chained and doomed to walk the earth, witnessing but powerless to intervene in the suffering of the living. 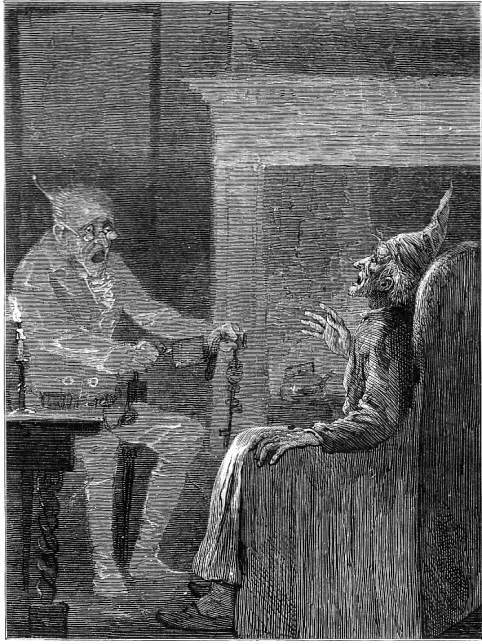 Although Fred Barnard has realised the same scene in his British Household Edition illustration "Marley's Ghost", there little character comedy but much of the gothic melodrama in Abbey's weird treatment of the celebrated scene. His color changed though, when, without a pause, it came on through the heavy door, and passed into the room before his eyes. Upon its coming in, the dying flame leaped up, as though it cried, "I know him; Marley's Ghost!" and fell again. Abbey's treatment is more fluid and natural than Eytinge's, and his figures more realistically modelled than Leech's. 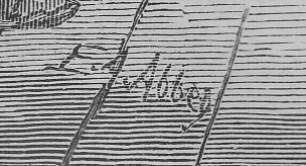 The horizontal orientation of the plate affords Abbey greater opportunity to develop the background, whose details are less cluttered than those in Barnard's contemporary wood-engraving. 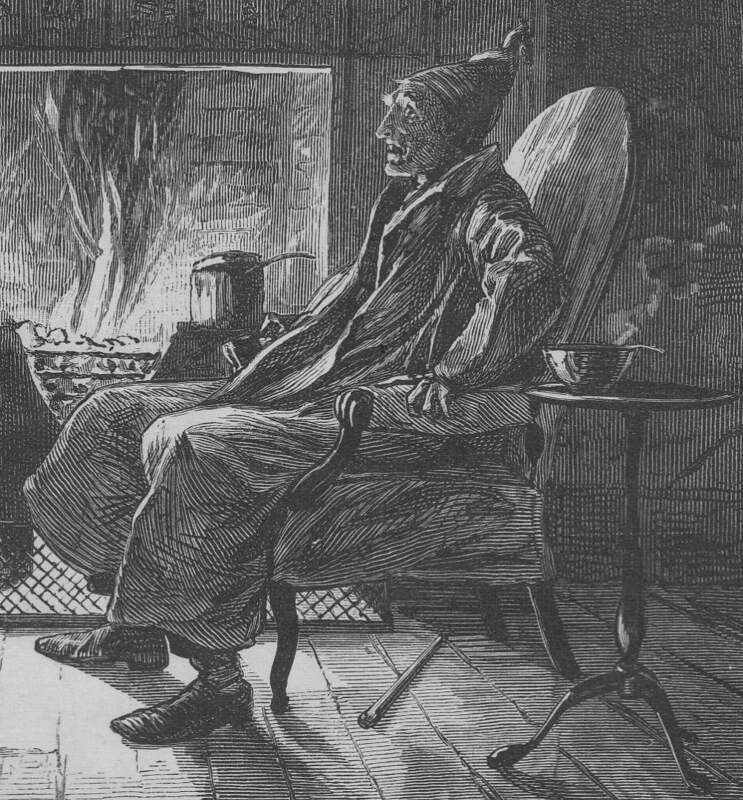 But the most significant departure is Abbey's treating the scene seriously rather than whimsically as his Scrooge's horrified reaction is understated, the expression on Marley's face obscured (thereby rendering him more mysterious), and the whole scene imbued with an eerie atmosphere as a consequence of the chiaroscuro into which the momentarily roaring coal-fire has cast the darkened room, suggestive not merely of Scrooge's parsimony (his reluctance to consume coal, even to heat his own bedroom) but of his bleak spiritual state. Whereas the other artists have illuminated the scene by a flaring candle — in Leech's original, for example, one may readily apprehend the wainscotting, and the tiles inside the fireplace — Abbey has elected the make this a "dark" plate, contrasting the blazing hearth and the deep shadows on either side. Moreover, only his version accords prominence to the biblically-themed Dutch tiles fronting the fire-place, although the nature of the scenes and figures from the "Scriptures" Abbey has not particularized. His bare floor-boards, creating aerial perspective, are drawn directly from the Leech original, as are the fire-guard, hob, and bowl of gruel. But Abbey has replaced the rigidity and two-dimensionalism of Leech's Marley with a more naturalistic pose and a more modelled figure, while eliminating the whimsy of the blazing candle's face. The story's steeply contrasting strains — the terror of the supernatural and the sentimental, domestic humour of the Cratchits — are represented by the large-scale frontispiece and the title-page vignette respectively, the latter conveying the Christmastide wish of the cheerful Tiny Tim. Davis, Paul. Charles Dickens A to Z: The Essential Reference to His Life and Work. New York: Facts On File, 1998. Davis, Paul. The Lives and Times of Ebenezer Scrooge. New Haven and London: Yale U. P., 1990. Dickens, Charles. Christmas Stories. Il. E. A. Abbey. The Household Edition. New York: Harper and Brothers, 1876. Guida, Fred. "A Christmas Carol" and Its Adaptations. Jefferson, NC: McFarland, 2000. Hammerton, J. A. 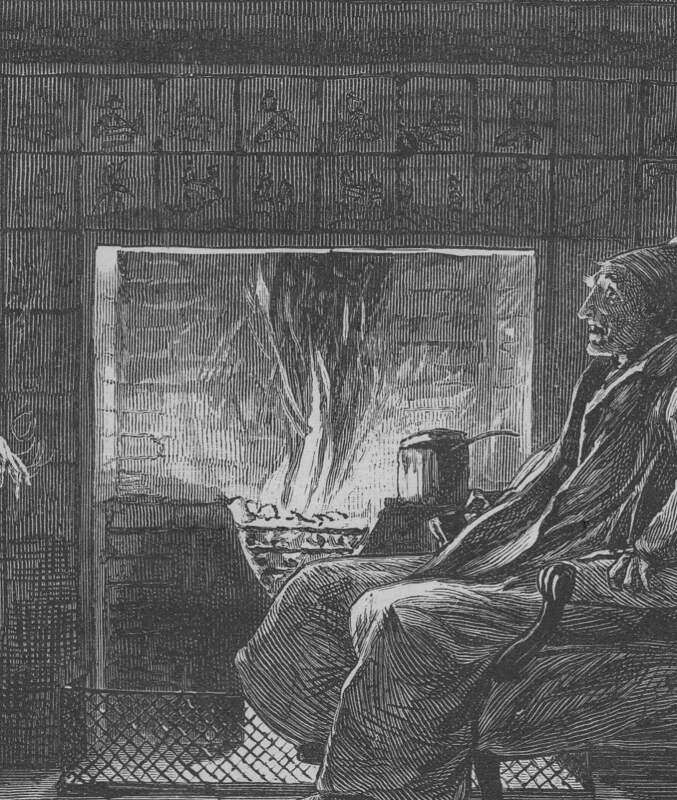 The Dickens Picture-Book: A Record of the Dickens Illustrators. The Charles Dickens Library. London: Educational Book, 1912. Parker, David. Christmas and Charles Dickens. New York: AMS Press, 2005. Thomas, Deborah A. Dickens and The Short Story. Philadelphia: U. Pennsylvania Press, 1982.